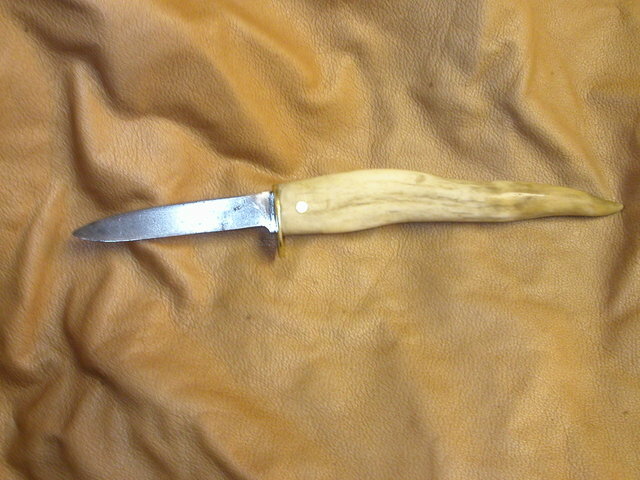 Decided to go ahead and make a sheath for the new knife. Dug through the pile and found a piece that looked about right. Fit the knife about right when folded over. Bit at the top folded down and looks like it will work as the belt loop. Got the tools out and some rivets. Punched the first hole in the belt loop and riveted it with the hammer as the rivet tool doesn’t have a deep enough throat to reach that one. Hole punch just fit. Here’s how it looks from the back. 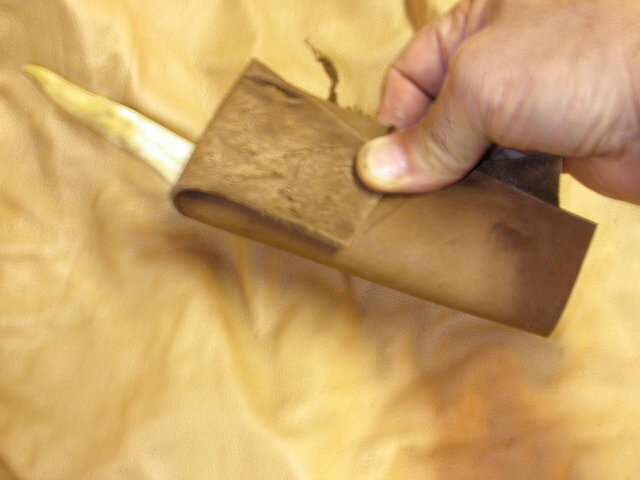 Used the new knife to trim the leather up. Did a great job! Top rivet was first one put in. 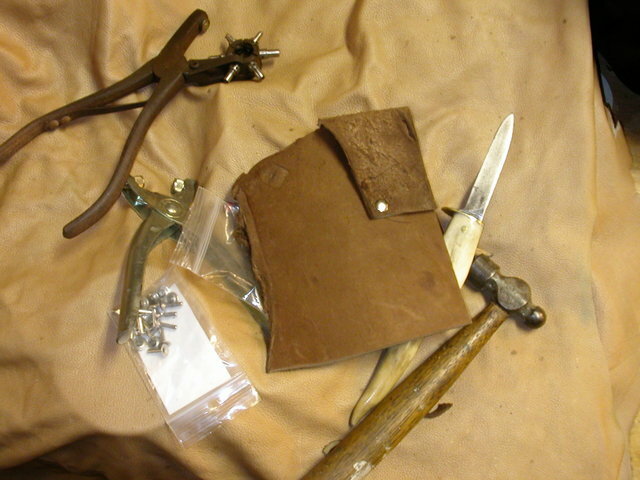 Put the knife in place and pulled the leather around it and slid it in and out to adjust the fit and then punched the hole and put the rivet in. Second one was the one at the bottom to stop the blade from going any lower. Third one was through 3 thicknesses of leather as it holds the other side of the belt loop and took a longer rivet. 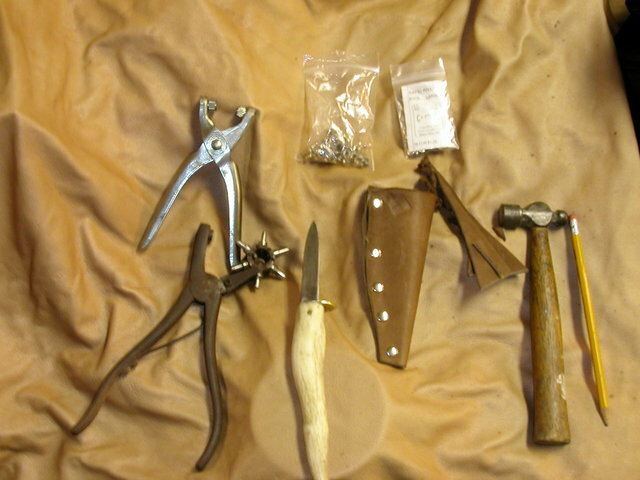 Last 2 rivets in and the sheath is done other than for oiling/waxing. Knife fits good and tight and shouldn’t come out in the woods. 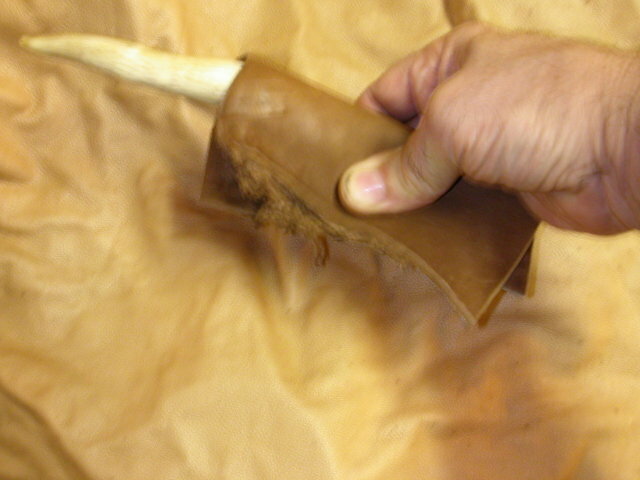 And that’s the sheath done. One piece of leather and 6 rivets. 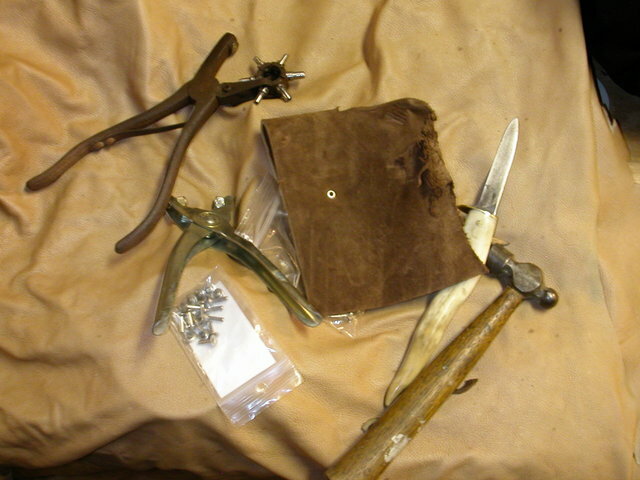 A small pile of scrap leather and all the tools used in the making. Had an old carbon steel kitchen/steak knife that’s been kicking around for a while. Been wanting to do something with it and since our plans for the day got rained out decided to see what I could make. 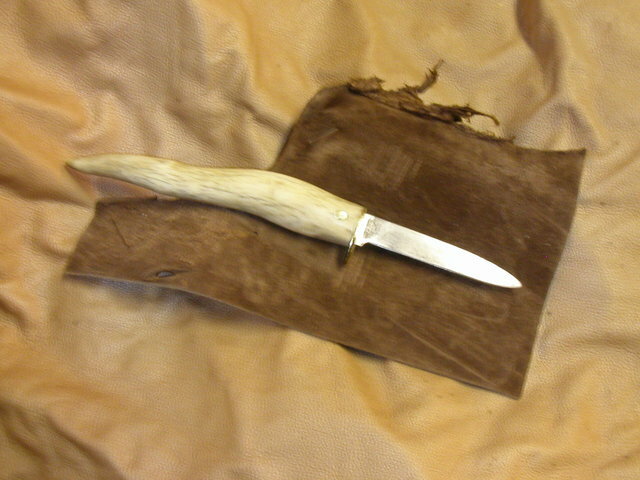 Got into the antler pile and found a piece that felt about right in my hand and with a little cutting, trimming, grinding, and filing got it to where it looked about right with the blade. Drilled holes in the end and dug/cut/filed till I could fit the tang down in the hole. 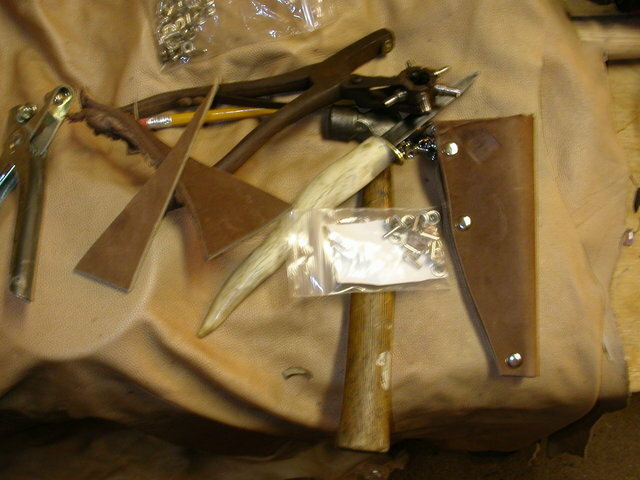 Cut a piece of brass to fit the end of the antler and cut a slot for the blade. 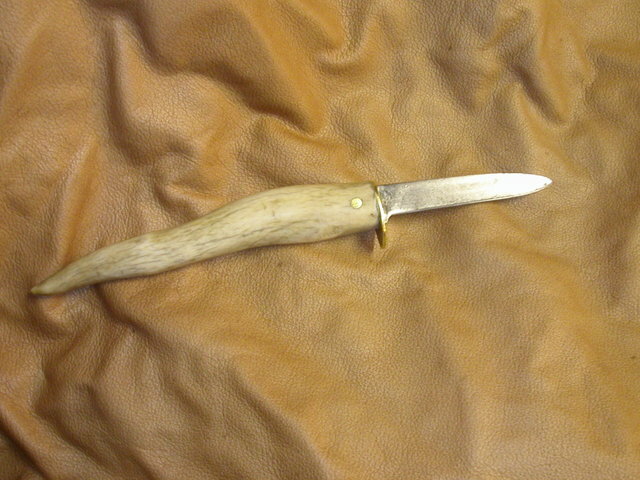 Cut a piece of brass rod and drilled a hole in the antler to pin the blade in. Kneaded up some epoxy and filled the holes up and then forced the blade in. Put the pin in and before the epoxy set beat on the ends with a hammer to swell them and set them in the holes and then let it set up. 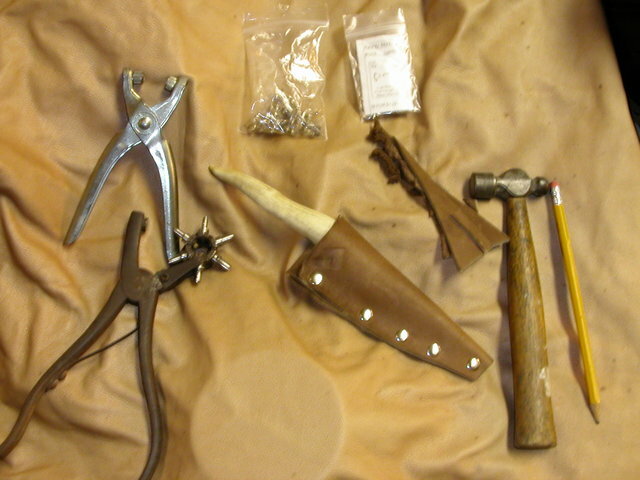 Once set up filed the guard and pin to properly fit the shape of the handle and filed the handle smooth. Did a bit of sanding and sharpened the blade and have a much nicer knife. No pix of the process but here are a couple of the finished product. Haven’t decided on what kind of sheath I’m gonna make for it yet. Handle is a bit long for the blade but it feels good in the hand so am going to leave it this way and use it for a while and see how it works out. Gonna have to make some of these! Too Cool!